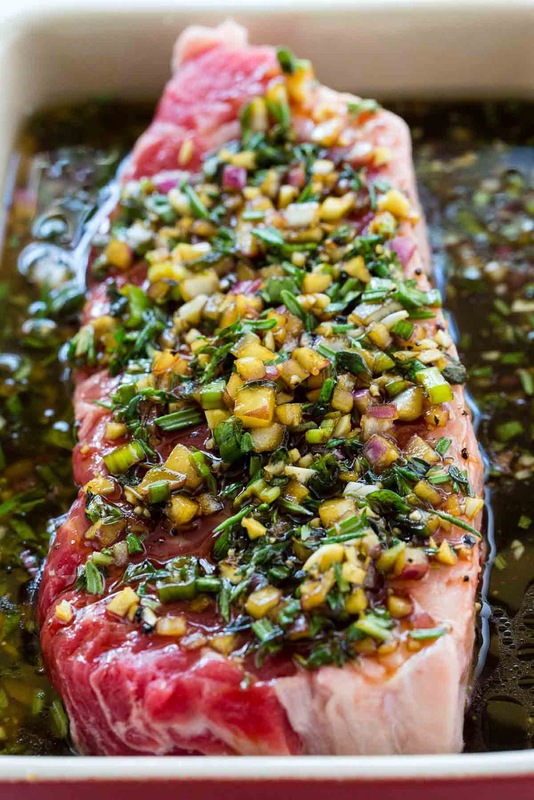 This easy steak marinade recipe is the BEST, and it will quickly add tons of flavor to any cut of beef! The mixture is a blend of soy sauce, Worcestershire sauce, onion, garlic, honey, olive oil, and fresh herbs. Quick & easy steak marinade recipe made of soy sauce, Worcestershire sauce, onion, garlic, honey, olive oil, and fresh herbs. In a medium-sized bowl whisk together soy sauce, olive oil, Worcestershire sauce, red onion, honey, green onions, garlic, thyme, rosemary, salt, and pepper. In a small bowl add 1/4 cup of the steak marinade and red wine vinegar, set aside. Add steak to a baking dish or large resealable plastic bag. Pour the marinade over, cover, and refrigerate for 30 minutes. Press out the excess air if using a ziplock bag. Flip steak over and marinate an additional 30 minutes in the refrigerator. Remove the steak from the marinade and pat dry with paper towels to remove excess moisture from the surface. Cook steaks using the desired cooking method, such as pan sear, reverse sear, or grill. Transfer steak to a cutting board and tent with foil for 10 minutes before slicing. Pour reserved marinade over the steak or serve on the side. The recipe makes 1 cup of marinade. One cup of marinade is needed per 2 pounds of steak. Increase recipe size as needed. 0 Response to "THE BEST STEAK MARINADE"